Before arrival of the British colonial Masters, when a Man's right is trampled upon in any Biafran clan, he has opportunity to call his kinsmen for mediation and if his kinsmen weren't able to settle the dispute, he has rights to involve his maternal people and if eventually, they were not able to mediate, finally he cry out to his in-laws. Coincidentally before 1914 forced amalgamation. Biafrans as an organic civilized people have legal proceedings devoid of injustice. That's any case must follow through a fair hearing to avoid perversion of justice. Muhammadu Buhari in connivance with corrupt Nigerian judges and the judicial system is hellbent to subterfuge injustice in Nnamdi Kanu's case. 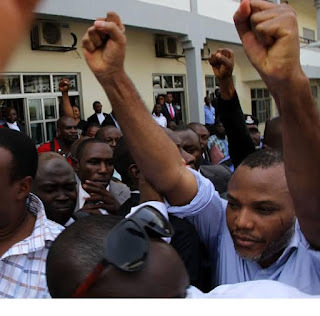 Despite refusing his release after two competent courts of jurisdiction issued Kanu to be released on bail, thereafter, Muhammadu Buhari acknowledges publicly on 29th December 2015 during a media chat that he won't release Kanu therefore, publicly refusing to obey the court's ruling, a clear travesty of justice. As Buhari is busy searching for another judge to take up the case after Justice John Tsoho hands off the case alleging corruption and incompetence, Kanu has presented his case before ECOWAS Court, dated to be heard on Wednesday 5th of October, 2016. According to sources, judges are now running away from Kanu's case or risk spending rest of their lives in International Criminal Court, ICC. ECOWAS Court of Justice is the judicial organ of the Economic Community of West African States (ECOWAS) and is charged with resolving disputes related to the community's treaty, protocols and conventions. The ECOWAS Community Court of Justice has the competence to hear individual complaints of alleged human rights violations. From the above jurisdictions of ECOWAS Court, it has the competence to hear Kanu's case. Every evidence is in abundance to prove violation of Kanu's human rights. Amnesty International has written several reports concerning Kanu's human rights violations. Many human rights organizations have also cried out to the world. Just on October 2nd, 2016 International Society for Civil Liberties and the Rule of Law, wrote an open letter titled "Arbitrary Detention By Buhari's DSS, The 1999 Constitution Wails As Nigeria Turns 56" to Abubakar Malami, Nigeria’s federal attorney general decrying the human rights abuses perpetrated by security agencies in the country since President Muhammadu Buhari was sworn into office in May, 2015. The letter focuses on illegal arrest and detention of IPOB members by the DSS and precisely violation of Kanu's human rights. Kanu has taken his case to regional Court (ECOWAS) and will not hesitate to visit International Court of Justice if the regional court couldn't prevail. I doubt if ECOWAS would be cheap enough to allow her image dragged to the mould because of fantastically corrupt Nigeria. ECOWAS is known to be a respected body of West African States and should avoid denting her image due to mere sinking geographical expression Nigeria. We are also aware that Nigeria government have started their blackmailing processes by putting to hold their statutory duties towards ECOWAS and used recession as excuses. The same government that's complaining of recession in order not to pay her duties to ECOWAS is funding grazing reserves and ranches all over Nigerian states for Fulani terrorists. ECOWAS Court should be aware that Intentional Communities beacons on them to settle this case without fear or favour. ECOWAS Court should also compel Nigeria government to release all the Biafran Activists held captives in different DSS dungeons. Inter-society have accurate data for that if you need to verify the atrocities perpetuated by the Buhari's DSS.